The Israelites were Arab tribe in Yemen speaking Old Arabic language and they wrote it at some stage in the ancient South Arabian script called “Musnad” till 1460 BC. The Arabic language of the Israelite changed substantially from the original Arabic language of other Yemenis and Arabs during the 430 years stay of the Israelites in Ethiopia from 1876 BC to 1446 BC. Whether the Musnad scripts came to Arabia from Africa or the other way around is not yet certainly known. The South Arabian script became extinct immediately after Islam, now it only survives as Ge’ez scripts in Ethiopia and Eritrea. This fact supports the hypothesis that the Musnad scripts originated in Ethiopia. 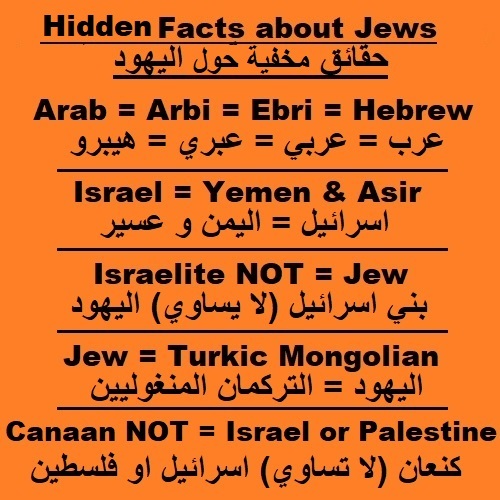 The Israelite were not called Hebrew (Ebri) before they invaded Canaan in 1400 BC, they were still called by others and by themselves Arbi “Arabs”. Many Israelite after the death of Moses refused to join the invasion of Canaan and preferred to remain in their original homeland of Yemen and Asir (now in Saudi Arabia); and they either continued normal life as it was before the Scriptures or followed the original teachings of Moses which was not yet called Judaism. Only after the majority of Arab Israelite colonized Canaan and intermarried with Canaanite and other tribes they called themselves Ebri (Hebrew) and they were using their Arabic language but with scripts derived from Phoenician scripts. Marriage from non-Israelite tribes was still allowed till the Turkic Jews came and cancelled them with newly inserted codes in 530 BC to allow them to become Israelite and multiply. The oldest found Hebrew inscriptions date to 1000 BC only. The Paleo-Hebrew alphabet is only a variant of the Phoenician alphabet. The Arabic language of Israelite in Canaan continued to borrow heavily from the Canaanites and Phoenician. After sometime they called the new hybrid language Ancient Hebrew language, and its scripts continued to develop even further with the later Turkic Persian influence and beyond 530 BC. The extinction of the Ancient South Arabian script “Musnad” in 660 AD was deliberate act from Turkic Jews who controlled the remaining Hebrew Israelite minority. They influenced the Arabs to write the Holy Quran in a newly developed script borrowed from Nabataean language from North Arabia, and the Arabs ignored the ancient and well developed and widely used script of South Arabian “Musnad”. The History of the origins and developments of the Hebrew language is another well-kept secret and shrouded with myths. Sure this history can reveal the secrets of the Israelites, Jews, and Hebrew Bible. According to the Hebrew Bible, the exact place of Moses’ grave remains unknown, in order to impede idolatry. hhhhhhh. Moses died in Yemen, he never went any further, that is why no one will never find his tomb.